Ioustiani Palace (also known as Palataki) is hostied in a historical building dated between the 14th and 15th century A.D., is situated between the central gate of the Castle of Chios and the main square of the town. It was, perhaps, the headquarters of the Genoese Podesta. Disfigured by Turkish alterations and additions, it was restored during the years 1980-1986 by the Archeological Service. 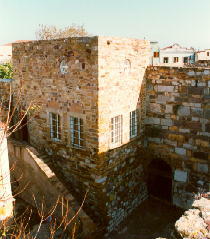 The building maintains a fortress-like appearance and has two floors, each containing one room. On the northern side of the Palace, there is an external stairway which leads to the walls and the southeast tower of the Castle. In the actual exhibition, Byzantine murals, post-Byzantine icons, Byzantine and Genoese sculptures and small-scale works of art are on display. Twelve Byzantine frescoes of Prophets (13th century), which were detached from the dome of the Church of Panaghia Krina in Vavili, Chios. The full-length icon of the Archangel Michael (18th century) which comes from the village of Olympi,Chios. Marble Byzantine slab depicting a griffin and a chimaira (12th century) in low relief which was found in the town of Chios. Marble slab from a pulpit, with the personification of DIALECTICA in high relief. Genoese work of early Renaissance period found at the town of Chios. Half-length icon of Aghios Antonios (Cretan school, 16th century) which was found from the village of Olympi, Chios. Fragment of a small icon depicting the Assumption of the Virgin Mary which was found in the town of Chios.